Archaeologists in Edinburgh have unearthed a stone artillery ball of the type launched from a trebuchet in the Middle Ages. The heavy sphere looks like a cannonball, only it is made of solid rock and was being hurled at castle walls 200 years before gunpowder reached Scotland. The type and size of the ball date it to the 13th century, a time when Scotland was under heavy assault by Edward I in full Malleus Scotorum mode. The find was made in the Grassmarket area of Edinburgh’s Old Town where excavations are taking place in advance of construction of a new hotel. The neighborhood lies in a hollow below Edinburgh Castle, a prime location for a medieval catapult balls to settle into for hundreds of years. There’s a candidate for the precise date when the ball was catapulted: the 1296 Siege of Edinburgh during the First War of Scottish Independence. This was the first major battle at the castle since it was built in the 12th century. For three days, Edward bombarded Edinburgh Castle non-stop using all the heavy artillery in his arsenal. This could be one of the many balls catapulted by Longshanks during the siege, or it could be one of the ones lobbed at him from the castle ramparts. 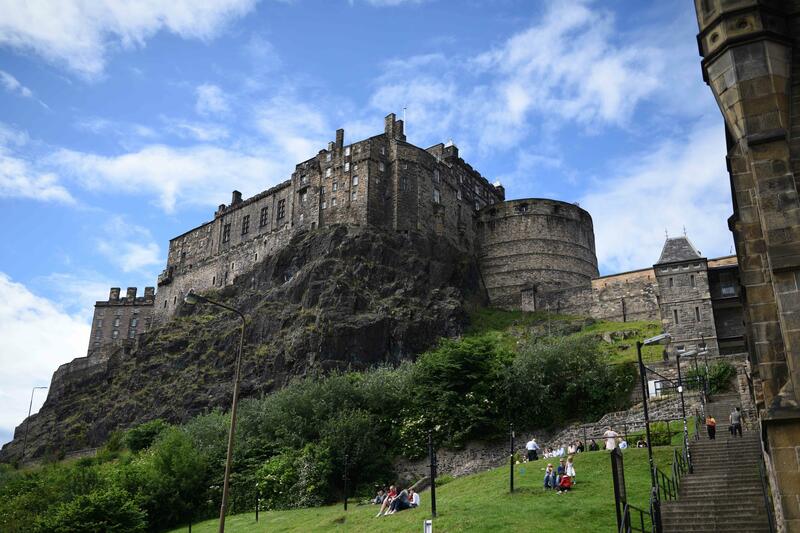 The siege saw Edward I capture Edinburgh Castle and hold it under English rule for 18 years, plundering treasure from across Scotland including the Stone of Destiny in the process. 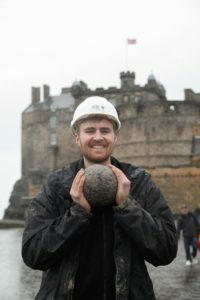 John Lawson, City of Edinburgh Council archaeologist, said: “It looks like the type of ball which would have been fired by a trebuchet, one of the most powerful catapults used in the Middle Ages. “Worldwide, the most famous account of a trebuchet is that of Warwolf, the giant catapult used by Edward I’s army at Stirling Castle in 1304. “What we’ve discovered here suggests similar weapons were also used in Edinburgh, possibly even during Edward I’s Siege of Edinburgh in 1296, when the Stone of Destiny was stolen and the castle taken out of Scottish hands. The castle was besieged many, many times after the first big to-do, so determining with certainty when this one ball was launched is difficult (read nigh on impossible). This entry was posted on Monday, December 31st, 2018 at 10:52 PM	and is filed under Medieval. You can follow any responses to this entry through the RSS 2.0 feed. You can skip to the end and leave a response. Pinging is currently not allowed. Thank you for this very interesting story. The stone ball is a cool find. That said, such stone balls were still being used with early guns. The famous 15th century gun Meg Mons displayed in Edinburg castle has several such stone balls stacked beside it. Thank you also for the mention of Stirling Castle, the War Wolf, and the siege of 1304. My direct ancestor, John le Nae Peer (aka Napier), was one of 26 surviving Scottish gentleman defenders of Stirling Castle. John is known because Edward I held all the men of property for ransom. John’s family had to cough up the equivalent value of three years income from his estate to get him sprung. He died shortly after being freed, probably of disease or privation while in prison. About 50 common soldiers from the Stirling garrison, plus a few fortunate civilian servants, also survived the siege. In a surprising show of mercy, Edward told them not to make any more trouble and let them go. The only exception was an Englishman from the Scottish side whom Edward hanged for treason. Mungo, that was interesting, and my respects for your excellent ancestor. Both Stirling and Edinburgh castles look like absolute sods to take with the armaments of the day, especially with the lochs and marshes of the time. In fact, if I remember my primary school history correctly, Bruce’s men had to take Edinburgh by a ruse; and of course he had to fight the battle at Bannockburn to gain Stirling. Sorry I don’t comment often, but I love this blog. Thank you for all your hard work and the great posts and pictures. Thanks also to you, Mungo and Jeff, for your personal comments. They make this post even richer. Such stone balls were also very commonly used as decorative architectural finials on fancy buildings such as castles. What makes this a trebuchet shot as opposed to a finial?